He said the Church was attempting to address the problem but said it was "still going on". Last November, the Catholic Church's global organisation for nuns denounced the "culture of silence and secrecy" that prevented them from speaking out. The Pope's comments come amid long-running cases of sexual abuse of children and young men by priests at the Church. What did Pope Francis say? Speaking to reporters while on a historic tour of the Middle East on Tuesday, the pontiff admitted that the Church had an issue, and the roots lay in society "seeing women as second class". "It's a path that we've been on," he said. "Pope Benedict had the courage to dissolve a female congregation which was at a certain level, because this slavery of women had entered it - slavery, even to the point of sexual slavery - on the part of clerics or the founder." Pope Francis said sexual abuse of nuns was an ongoing problem, but happened largely in "certain congregations, predominantly new ones". "I think it's still taking place because it's not as though the moment you become aware of something it goes away." Where is the abuse said to have taken place? The female congregation dissolved in 2005 under Pope Benedict was the Community of St Jean, which was based in France, Alessandro Gisotti of the Vatican press office told CBS News. In 2013, the Community of St Jean admitted that priests had behaved "in ways that went against chastity" with several women in the order, according to the French Roman Catholic newspaper La Croix. In a separate case in India last year, a bishop was arrested over allegations that he raped a nun 13 times between 2014 and 2016. Bishop Franco Mulakkal, who headed the diocese in Jalandhar in the northern state of Punjab, has denied the accusations. In Chile, reports of abuse of nuns carried out by priests led the Vatican to launch an investigation last year. The women were reportedly removed from the order after highlighting the abuse. Last year, the Associated Press news agency reported cases of abuse in Italy and Africa. What have women in the Church said? 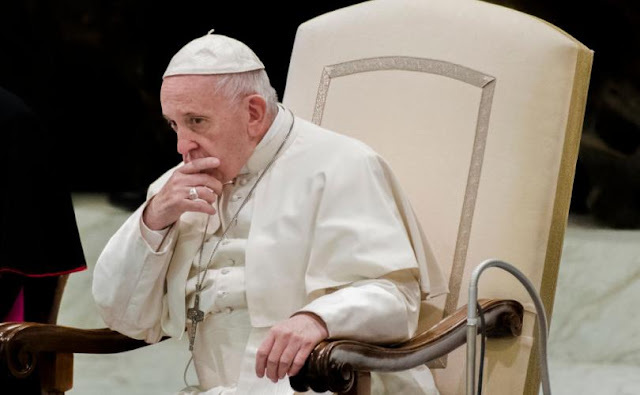 The magazine's editor, Lucetta Scaraffia, said Pope Francis's acknowledgement of the abuse "can be of some help", but warned that the Church needs to act. "If the Church continues to close its eyes to the scandal... the condition of oppression of women in the church will never change," she wrote. Last year, French website Le Parisien reported the case of "Christelle" (in French), a former nun whose name was changed to preserve anonymity. Christelle said she had suffered sexual abuse at the hands of a priest of her congregation in France between 2010 and 2011. "His gestures became more and more inappropriate," she said, adding: "But he kept going... until the day he raped me. "He was unable to control himself... he had a split personality."